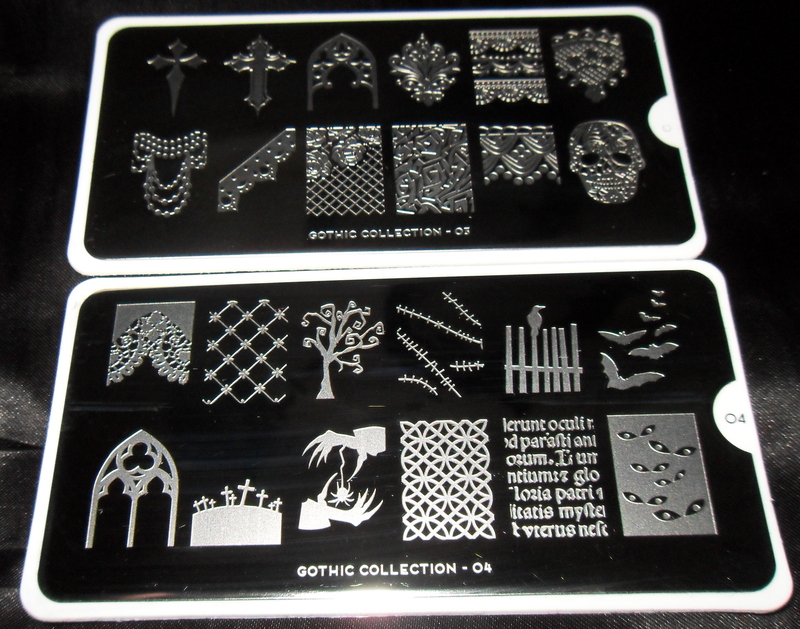 Today I have the first four plates from the Moyou Gothic Collection to show you! I have to say I haven’t really been that interested in the more recent collections from Moyou London, but then they had to go and bring this collection out… Oh my poor bank account! I have to say after doing all of these I have realized I’m definitely better at stamping onto my nails than onto paper, lol there was polish everywhere! With all Moyou plates I have used the images transfer really cleanly and this plate is no exception! I really like the Dr Who(-ish) weeping angel, the spooky tree, and the couple of symbols from the TV show Supernatural. Plate 2 was actually the last plate that I stamped onto paper so sorry about the mess I was starting to get really board! I love the key and lock images, I found them to be a really good size for my nail length, but they may be a touch too long for really short nails. I have a couple of stamping plates with keys on and they are plain and boring, but these little keys have a lot of detail! I did find that the little skull and crossbones didn’t pick up as well as the other images, (it could just have been me getting sloppy with my technique) I’m going to group them with the nine sets of vampire teeth as images I’m not particularly interested in. I really like the Celtic knots, I have a few ideas for those already. The ankhs and the skull in a top hat… Very Alchemy Gothic! On to plates 3 and 4! 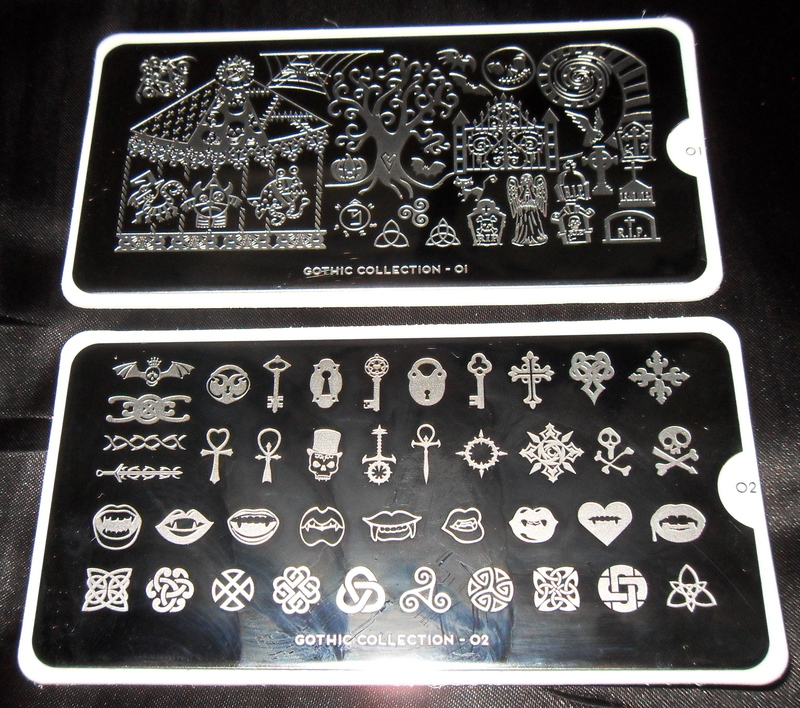 These are both Xl plates, I found that the single images are way too big, even for my thumbs! But they might be good for my big toe nails! 🙂 or they may become useable with some creative stamper squishing! 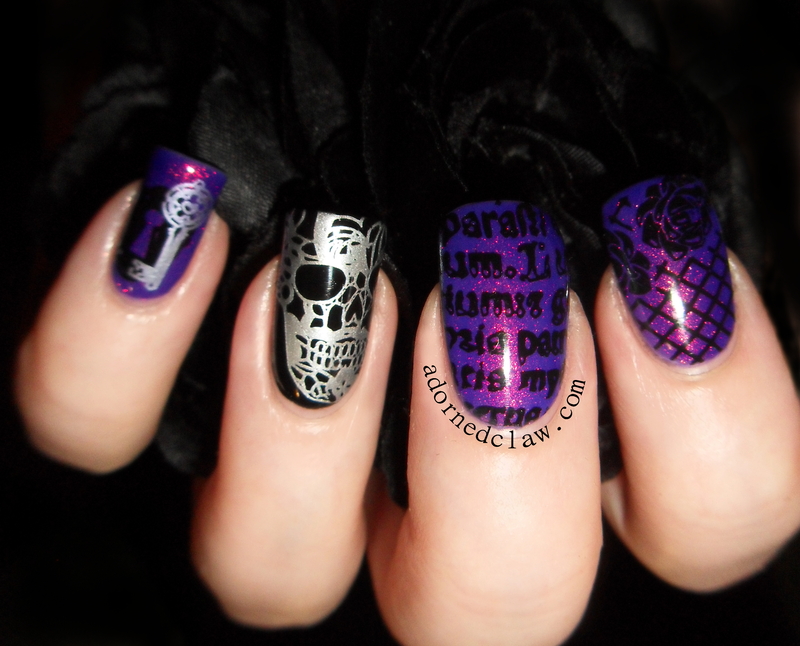 From the images on plate 3 I think the lace skull is amazing! I actually like all of the lace images from this plate. From plate 4 the images for me that really stand out are the text, tree and the crow. The only image I had a problem with stamping is the little cemetery, it needs a light touch with the scraper, it’s far to easy to scoop out the polish from the center of the hill. 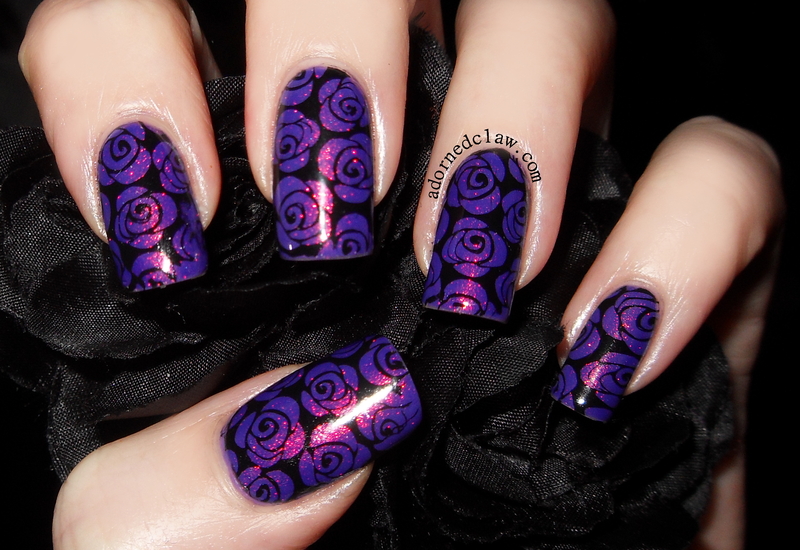 Here are a couple more pictures of the mani I created while messing about with these plates! 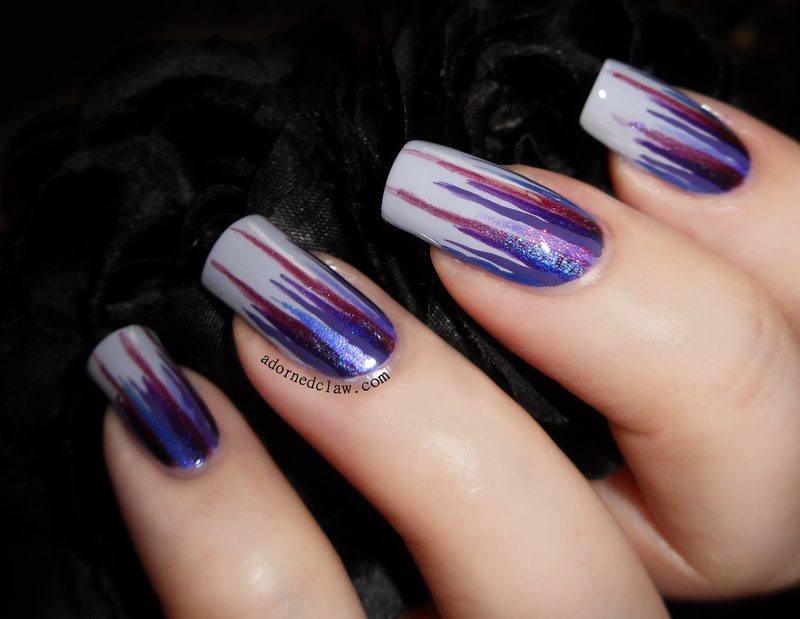 I started with a couple of coats of Good To Grape, followed by two coats of Fantasy Fire, on my ring finger I used two coats of Twilight. 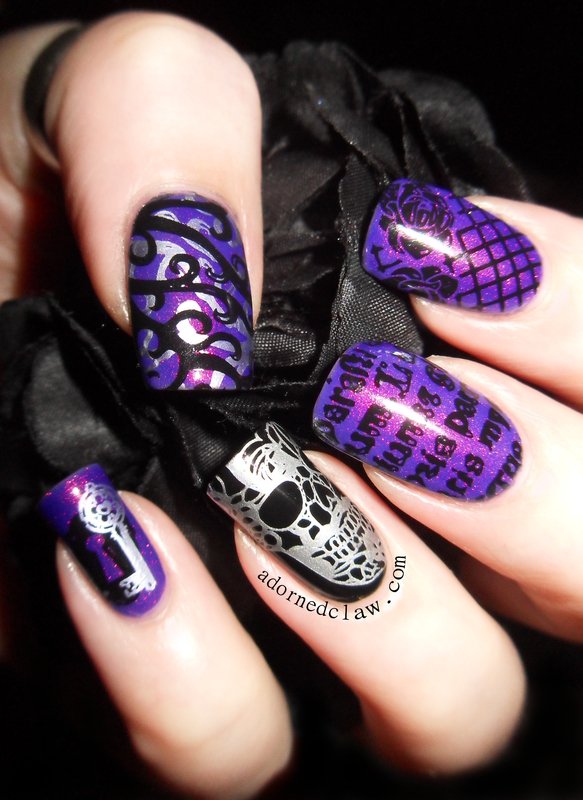 On my thumb I used the tree image from plate 1 double stamped with konad black and moonstruck, on my index finger nail the rose and fishnet image along with the lace skull on my ring finger nail are both from plate 3, the text on my middle finger is from plate 4 and finally on my little finger nail the key and lock are both from plate 2. Then a nice thick coat of Seche Vite! 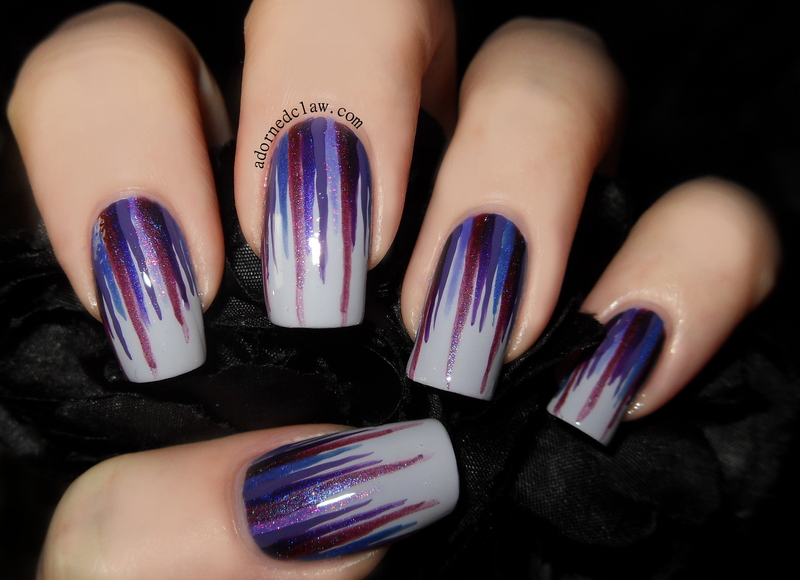 Fantasy Fire, Good To Grape, Twilight and Moonstruck!